On Wednesday, December 4th, there will be a special robot DJ, and special guests lighting the menorah. Also on December 4th, the Westfield San Francisco Centre will host a menorah lighting (partnering with Bill Graham Menorah Project) and will light the candles for the last night at 6:00. That will be at Level 4 Under the Dome with Rabbi Langer of Chabad Pacific Heights. There will be traditional treats, arts/crafts, dreidel spinning and music. It's free and open to the public. PJCC - Foster City - Hanukkah Mixer on the 7th night of Hanukkah, Tuesday, December 3rd from 5:30-7, with live music, vodka tasting and latkes. For all ages. RSVP to 650-378-2703. 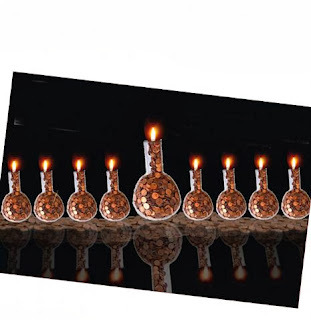 Hanukkah morning mixer on Tuesday, December 10 from 9-11 a.m., with latkes and other treats. Both events are free. Burlingame Menorah lighting - Monday, December 2nd at 6 p.m. Meet at 240 Park Road, by the Apple store. Juggling, comedy by Daniel DaVinci and the music of Jonathan Bayer. Plus latkes. Palo Alto JCC - Several events. On Tuesday, December 3rd, there's a family Hanukkah celebration sponsored by the preschool from 6-7, with candle lighting, songs, dreidels, latkes/doughnuts. Teens can stay (grades 6-12 - parents can attend too), for a tailored a Hanukkah celebration from 6:30-9. Food, games, performers. Free. Los Altos - Chabad of the South Bay is sponsoring a balloon Hanukkah celebration from 4:30-6. Includes giant balloon menorah, crafts, latkes, hot chocolate, face painting, balloon twisting and more. It's at Main and State Streets. Free. The works will take place at Chabad East Bay on Sunday, December 1, at 4:30. Menorah lighting, crafts, dreidels, latkes, crafts, face painting, plus glow-in-the-dark hula hooping. It happens at 1730 Fourth Street in Berkeley. On Tuesday, December 3rd, head over to Whole Foods for a menorah lighting, songs, olive oil tasting and other treats. It's in Berkeley's Whole Foods from 4:30-5:30.